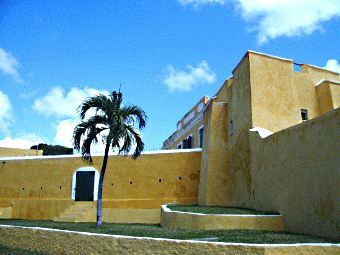 Fort Christiansvaern is undoubtedly the most imposing structure in Christiansted. Its high, pale yellow walls and ramparts dominate the town's National Historical Site. Located on a rise overlooking the city's harbor, it's an attraction you can't miss during your tour of Christiansted. The fort was erected between 1738 and 1749. It's made of Danish yellow bricks and masonry that were imported as ballast in the holds of sailing ships. The fort's purpose was to defend the harbor against pirates, to enforce the payment of taxes on imports and exports, and to deter slave insurrections. The structure is a four point citadel surrounding a central courtyard. Its pastel yellow color is typical of the Danish Colonial style of the era. The fort housed Danish troops, and, when pirates were afoot, the local citizens as well. In the latter part of the 19th century, the fort was used as a police station and courthouse. and a kitchen that show the style of lodging the Danish troops enjoyed. You can also see the cells that were used to punish prisoners and slaves. There's also an outfitted armory showing the small arms and munitions of the colonial era. Admission to the fort is from 8:00 AM to 5:00 PM weekdays, 9:00 AM to 5:00 PM weekends (closed on Federal holidays). The cost is $2.00. It's well worth visiting to get a close-up feel for the town's fascinating colonial past.